At Eola Dental, we treat patients like family. Our goal is to improve your oral health while helping you obtain a beautiful aesthetic. Dr. Dinesh Patel takes pride in combining art and science to deliver patients the smile they deserve. He takes a compassionate approach to each patient’s treatment plan and prefers to pursue dentistry as the passion of his life, not just a job. Our treatment plans are complemented by the latest in techniques and technology to deliver quality dental care. We utilize digital x-rays, intra-oral cameras, Diagnodent, and gentle sedation to ensure our patients are comfortable and well taken care of. We also pride ourselves on being an amalgam-free practice, whereby we will remove amalgam and replace it with a more biocompatible material. Our team also maintains positions as members of the American Dental Association, Illinois State Dental Society, International Congress of Oral Implantologists, and the Chicago Dental Society. Through such memberships, we are poised to stay abreast of new technologies and methods in the dental community. Our team strives to accommodate our patients’ busy lifestyles. We provide convenient Saturday hours for patients with busy work weeks, as well as flexible payments options for those seeking Care Credit financing. Dr. Patel also offers evening appointments on select days of the week for those needing to schedule their appointment after the workday is complete. 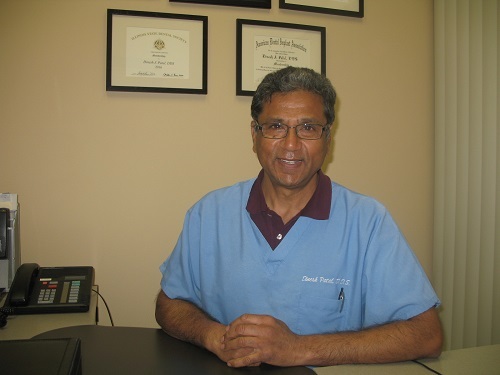 Dr. Patel has been treating patients in Aurora, North Aurora, Naperville, and surrounding neighborhoods for over 20 years and has been in practice for over 30 years. His compassion for patients shows through his patient-first philosophy. We’re here to listen to your needs and deliver solutions that will fully address your concerns, whether you need a general cleaning, cosmetic treatments, or a full-mouth restoration. If you’re seeking a qualified and experienced dentist who serves patients in Aurora, North Aurora, Naperville, Oswego, Plaifield, Wheaton, and Geneva, the team Eola Dental is happy to serve you. Our compassionate approach to dentistry is sure to put a healthy smile on your face. Feel free to give us a call or request an appointment online today!